diverse landscapes of Colombia's stunning interior. A 9-day cycling adventure from Medellín to Cali, through the eje cafetero of Colombia’s incredibly biodiverse, rich interior. Learn about urban renewal in the city, then get deep into culture, landscape and society while experiencing backroads, coffee, incredible local food, waterfalls and community organizations along the way. This trip makes a great add-on for our Heart of Colombia itinerary in July! We’ll start the day getting a first hand insight into just some of the local social impact issues in Colombia with a visit to the Comuna 13 neighborhood. Amidst the vibrant colors of this barrio are the outdoor escalators that provide access to homes in marginalized areas that were formerly isolated from the city below. After lunch, we’ll make our way to the mountainside pueblo of Jericó by van arriving by early evening. Today we’ll cycle from Jericó to Jardín. An early start along the compact gravel roads will see us mostly enjoying some slight downhill, before hitting the pavement for the final 11 miles. 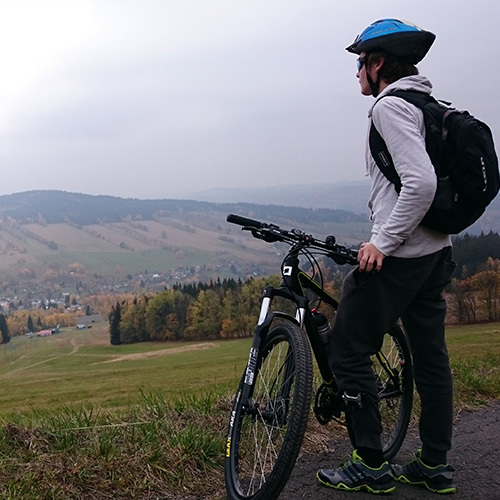 This is a great warm up day on the bike with plenty of varied terrain, epic scenery and quiet roads. 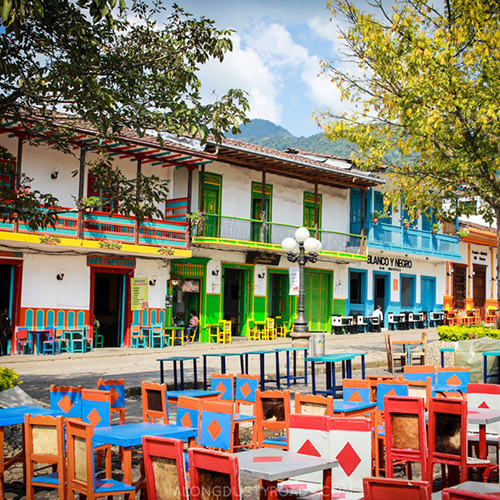 An early arrival in Jardín will give us time to check out the cable car in this charming village before a late afternoon visit to a local coffee farm. We’ll spend the morning exploring the beautiful surroundings of Jardín by bike, making our way to some of the region’s most spectacular waterfalls. After lunch, we’ll set off on our bikes to the small town of Riosucio. The whole day is 32 miles via compact gravel roads. You have the option to skip or cycle as much as you want with the support van within sight of our ride at all times. We’ll arrive into the quaint little town of Riosucio for late afternoon for a local feast and a well-earned rest. Today is a bit longer cycle day of 43 miles. We’ll get an early start with a morning transfer from Riosucio to the small town of Salamina before cycling towards Manizales on both pavement and compact gravel. We’ll break up the ride to enjoy the endless mountain and jungle scenery. We’ll arrive with enough time for a rest, a sunset vista and an epic Colombian feast at our local guide’s favorite restaurant. You’ve just stepped into the eje cafetero, the Coffee Axis of Colombia. With stunning vistas in every direction, this region is the world’s biggest producer of arabica beans. We’ll visit a small, organic coffee farm for a first-hand insight into this incredible industry, with the opportunity to taste (and purchase) along the way! Our cycle ride today takes us away from the main roads and through some of the most remote yet majestic landscapes Colombia has to offer. Stopping just short of Pereira, we’ll take the van to transfer us to La Union for a local dinner. In the early morning, we’ll cycle out from the hotel towards the small town of Yotoco, leading us into Cali by the mid afternoon. The road, free from the heavy traffic, wanders through smaller, scenic villages as we near Cali. We’ll cycle 56 miles today in the rolling hills about 3200 feet above sea level. The support van will be with us the whole time if you’d like a break, and we’ll transfer into Cali together on the last stretch. We’ll enjoy dinner together in this incredibly vibrant city, and likely catch some music while we’re at it! We’ll start the day with a visit to our non-profit partner learn about the social issues surrounding this area and what this incredible organization is doing to assist. The afternoon is yours to explore at your leisure. Perhaps take a taxi to the towering Christ statue atop Cerro las Cristales, Cristo Rey, check out the neo-gothic church, La Iglesia la Ermita, or wander through the food market, La Galeria de Alameda, for classic Colombian street food. We’ll enjoy a fabulous Farewell Dinner together and discuss all that we learned about this incredible country through our journey. Congratulations! You’ve cycled across the coffee axis of Colombia! We’ll enjoy a final breakfast together before we say goodbye to your newly formed friends. 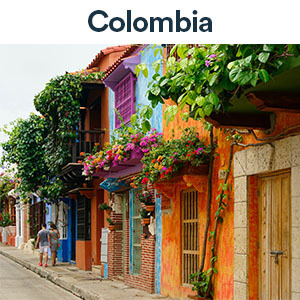 Depart from Cali or consider adding on a few days in Cartagena, Medellin or Bogotá. We’ll gladly assist with any ongoing travel plans you may have. Grouped by same gender unless requested otherwise. $400 off special for March dates! Combine with our July Heart of Colombia and receive a $200 off bundle discount! This ride is a joint collaboration between Social Cycles and Traverse Journeys. In 2019, the Cycle Colombia adventures will be hosted by either Brett or Ashley, or both! Each adventure will also have a local team of support driver, cycle guide and mechanic. Ashley Blake, Traverse Journeys founder, is an avid traveler, cultural consultant and outdoor enthusiast with a background in tourism, entrepreneurship and project management. She is a fluent Spanish speaker and has worked and traveled in 45 countries. Brett Seychell, Social Cycles founder, is an Australia based traveller, passionate about responsible travel, cycling and taking travel to new depths by exploring and learning from NGOs about local social impact issues and the influence of local culture. Both Ashley and Brett are incredibly excited about contributing to sustainable development through tourism in Colombia.